If the Bride of Frankenstein (or Marge Simpson) were a flapper, they would rock the same looks that are found in the Bette Franke Vogue Netherlands editorial. The standup hair (literally) is reminiscent of these two iconic characters, adding a modern touch to the vintage-inspired ensembles. From artfully windswept to slantedly sheared off, the hairstyles are funky and quirky. 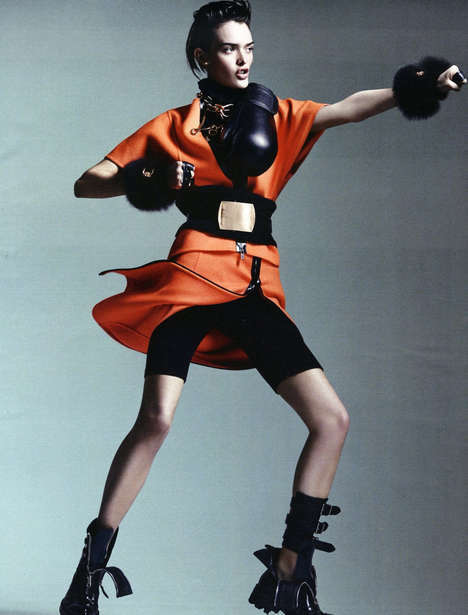 The Bette Franke Vogue Netherlands editorial was shot by Amsterdam-based photographer Marc de Groot. Set to appear in the magazine's April 2012 issue, the Dutch beauty was styled by Marije Goekoop. Goekoop pulled pieces from fashion houses such as Gucci, Ralph Lauren and Etro, pairing them with art deco accessories and platform heels. Beauty artist Irena Ruben lays claim to the shock of curls and barely-there glamorous makeup.